Has The Information Sector Employment Skid Stopped? Information has long been an industry sector that we watch closely. It requires special attention because it is a sector we specialize in here in Kansas City. Information is a broad sector that basically covers publishing (non-Internet), telecommunications and data processing. Sprint is our big player here, with about 7,000 employees. Although only 3 percent of our local workforce is employed in this industry, that is a significantly higher percentage than the nation (2 percent). This industry is also worth following closely because we’ve been losing information jobs at an alarming rate. Local employment in this sector peaked in August 2000, with more than 57,000 jobs. Today, that employment number stands at just 30,000, a decline of 47 percent. Nationally, the sector declined 38 percent over the same period. Keep in mind that the Information sector should not be confused with Information Technology (IT). IT is not a specific industry sector, but a commonly used term referring to computer and technology jobs. Under the federal classification system, these jobs are more likely to fall in the Professional and Business Services sector, which has seen substantial growth. 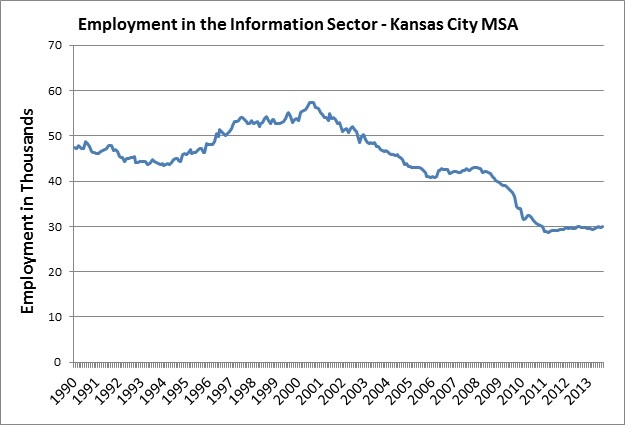 We have noted on several occasions that Kansas City’s overall employment performance has been less than stellar over the last decade or so. Clearly, being so invested in an industry that is losing overall employment contributes to this. But, there are signs that suggest we may have seen the bottom of the fall in this industry. Local employment in the Information sector hit a low of 28,700 jobs in March 2011 and has since crawled back to 30,000. Whether this trend continues or not might depend on how the proposed sale of Sprint to SoftBank plays out. The days of the Information sector being a local job creator may be gone, but if this sector has somewhat stabilized, at least it will no longer be such a drag on our overall local employment scene.